Campaign Against Dunn Reaches New Low With Ethics Complaint Against Chief Of Staff David Rountree » Mr. Dunn Goes to Montgomery | Who's Behind the Mask? And: I have re-written this story since it was published on April 18. Initially, I reported that Yellowhammer News violated a privacy clause in the Ethics Commission prohibiting the publishing, such as on the Internet, of ethics complaints that are unresolved or that are resolved without taking action. I believe I was in error on that point and apologize. It’s been pointed out that the privacy clause in all likelihood applies to to the commission, and not others who are provided a complaint and then publish it. Yellowhammer and Coal Jobs Count and all others involved in drafting and promoting coal miner John Box’s complaint would merely be guilty of the type of sleazy, underhanded acts that have been the norm in the campaign against Dunn. If you read this story, I believe you will question how anyone could possibly turn such innocent acts into an ethics complaint, and, thus, the firs step toward a criminal charge. And consider the following from the state ethics law. It regards the filing of an ethics complaint by a person who is acting on behalf of the true complainant in order to conceal that person’s identity. The complaint may only be filed by a person who has or persons who have actual knowledge of credible and verifiable information supporting the allegations contained in the complaint. A complainant may not file a complaint for another person or persons in order to circumvent this subsection. Yellowhammer News is the bright, shiny, much viewed conservative site about Alabama Politics run by Cliff Sims. “Coal Jobs Count” is a new group sponsored by the Alabama Coal Association. Among the Coal Association’s members: Alabama Power. On Tuesday afternoon, the two websites reported that Tuscaloosa coal miner John Box had sent a complaint to the Alabama Ethics Commission accusing David Rountree of committing two violations of the state ethics law. Both reports described the complaint in detail. Yellowhammer went a step further — it published the entire complaint, as well as two exhibits attached to the complaint. Odd thing is, the Ethics Commission had not yet received the report. Rountree, as you may know, is chief of staff to Public Service Commissioner Terry Dunn. He, like Dunn, has faced withering attacks in the past 16 months by so-called news organizations like Yellowhammer and shadily funded non-profits like JobKeeper Alliance notable for their allegiance in all matters to Alabama Power. In a moment, we will dissect the laughable complaint that “accuses” Rountree of 1) going on a TV news show to defend his boss against accusations by “Coal Jobs Count”; and, 2) listing his state cell number on a virtually non-existent political action committee that was formed to try to raise money for Dunn. On Tuesday afternoon, I — like thousands of others who follow Alabama politics and receive notifications of developments over Twitter and e-mail — learned that coal miner John Box had made an ethics complaint against Rountree. Twitter tells us that Yellowhammer’s Cliff Sims “tweeted” news of his story at about 2:30. The story was shortly thereafter ‘re-tweeted” by Coal Jobs Count, which also had its own story. Whether “Coal Jobs Count” had the story before or after Yellowhammer, I do not know. Probably it was a tie, since they serve the same master. Portions of each report matched the other verbatim. A more important question: Was Box’s complaint and and the accompanying stories proofed (if not actually drafted) by Alabama Power’s governmental relations gurus or political consultants/lobbyists working for Alabama Power? The likelihood that Box drafted the complaint and did the research that went into is close to nil, as I will soon explain. Here’s a portion of the top of Yellowhammers’ web-site after the story was posted. You can see the link to Box’s complaint in the first sentence of Cliff Sims’ story. And below: Box, via Facebook, shares Yellowhammer’s story about his complaint. Sounds like he’s pretty proud of that ethics complaint of his. How did Sims get a picture of Box? Box also appeared in a video produced last year. Its other participants included Dunn-bashing non-profits JobKeeper Alliance and PACE and various others associated with Alabama Power’s favorite political consulting firm, Matrix LLC. Rountree learned about Box’s complaint against him by reading it on Yellowhammer. When I read the stories I assumed that Box had already filed the complaint. Rountree contact the commission and learned that, at least as of late Wednesday, it had not yet arrived at the commission. The first charge relates to a recent TV interview Rountree did with Fox 6 in Birmingham, which I have not seen. Rountree told me that Fox 6 contacted Dunn’s office to say that someone with the coal industry or a group supporting the coal industry had contacted the station and urged them to do a report on Dunn. 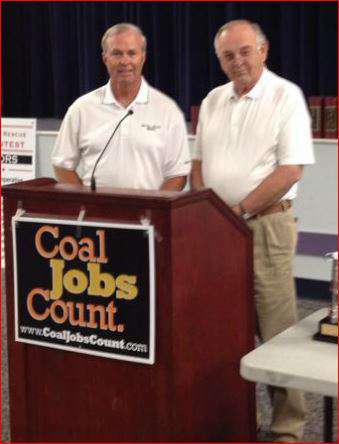 Coal Jobs Count held a press conference in February to announce its creation. Shortly thereafter it moved on to the real business at hand — slamming Terry Dunn with bogus claims that he’s trying to kill jobs. Someone should ask executive director Tiffany Bittner to identify a single coal job lost due to actions by Dunn in his four years at the PSC. She’s the new shill on the block, joining, among others, Patrick Cagle of JobKeeper Alliance, and Lance Brown of PACE. 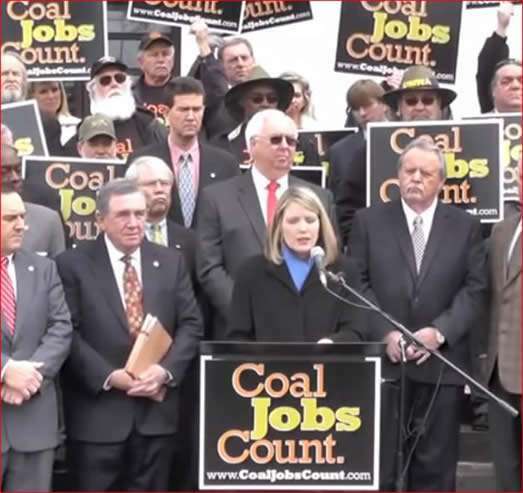 It may have been Coal Jobs Count, a new group led by former TV reporter Tiffany Bittner. The group is incensed or in any event pretending to be about a piece of legislation that was drafted at Dunn’s request but which was not even introduced in the recently concluded Legislative session. The legislation would prohibit businesses who sell fuel to Alabama’s regulated utilities from donating in PSC campaigns. This would apply to providers of natural gas as well as coal. Alabama Power and its employees, like Mobile Gas and Alagasco, is already prohibited from donating to PSC races. Dunn’s proposal would simply add fuel providers to the prohibition. It’s a famous truism that coal interests, including the coal association, are the primary sources of funding in PSC elections. They serve as a stand in for Alabama Power. Given Alabama Power’ dominance of the Legislature, the likelihood of Dunn’s legislation passing, ever, is beyond remote. That hasn’t stopped Alabama Power lackeys like Yellowhammer and Coal Jobs Count from howling about all the coal jobs that Dunn’s legislation is sure to eradicate. On top of that stretcher, they add another: Dunn’s ultimate goal is to eliminate coal donations to others so he can load up on campaign cash from environmentalists. Rountree, as a long-time former journalist, has among his duties served a media relations role for Dunn, as he did with the two previous commissioners for whom he worked, Susan Parker and Jim Sullivan. He called Fox 6 at the allotted time, expecting to be answering questions along with the anti-Dunn “coal person” who’d contacted the station. Instead, it was only Rountree. Someone had provided the reporter the catalogue of complaints about Dunn. Rountree answered a few questions, and hung up the phone. Interview over. I can’t say for certain that they set a trap, but it sure smells like it. After all, the complaint by Box — the miner in the Coal Jobs Counts video — accuses Rountree of going on a TV news show “during work hours;” and, once there, of “discussing the type of political donations” that the Dunn campaign would accept. Rountree, in order to reply to the ludicrous charge that Dunn will be showered with donations from environmentalists, told me he simply replied that, no, Dunn would not accept such donations. That, readers, is Ethics Complaint Number One. 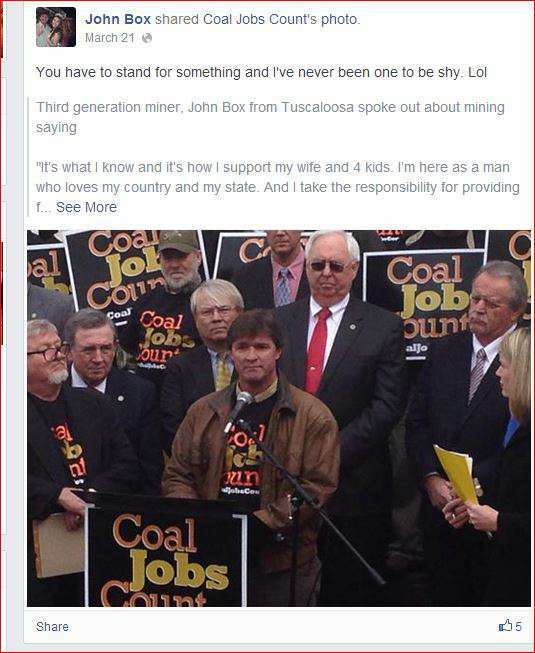 And below, yet another use, by “Coal Jobs Count,” of the poster boy for their cause, John Box. This image is from a video on YouTube. Patrick Cagle, executive director of JobKeeper Alliance. 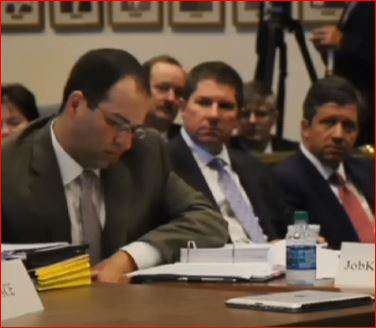 Cagle was given a seat at the front table at last year’s dog and pony show hearings on Alabama Power’s rates at the PSC. Behind Cagle’s left shoulder: Alabama Power VPs Zeke Smith, left, and Nick Sellers. I called Rountree. I have his personal cell phone number, not his state one, by the way. I sometimes call him, such as for comment for stories like this. He told me that he mistakenly put his state number on the form. Very soon after, the error was noticed, and Rountree returned to the Secretary of State and corrected the mistake by putting down his personal cell number. He said, and I believe him, that he has never used his state phone for campaign-related activities. And as he noted, the PAC in question is all but non-existent. If you go on the Secretary of State web-site and look up the reports filed by that PAC, you will see several reports, including the initial statement of organization. All show the same phone number — Rountree’s personal cell. You will also find that since it’s formation last February, Alabamians for Fair Utility Rates has received a grand total of about $1,3oo. Dunn’s personal campaign filings reveal that to the extent he can even afford a statewide campaign — and he cannot — that it will have to be self-funded. One of the attachments to Box’s complaint was a portion of the list of all Alabama PACS that’s on the Secretary of State. It does show Rountree’s state number with the PAC. Apparently the new PAC was put on the list upon its formation, and wasn’t corrected after Rountree returned and made the correction to the PAC’s statement of organization. Rountree said he intends to ask the Secretary of State’s office to correct the list so it will match all the other reports by the PAC. The second attachment is a portion of a bill for Rountree’s state cell phone from January 2013. How, do you suppose, did a Tuscaloosa coal miner get this record? I think I know. When I first met and interviewed Dunn in September, I asked him about the JobKeeper Alliance, which has produced some of the harshest criticisms and media images about Dunn and Rountree. He told me that JobKeeper director Patrick Cagle — son of a longtime Alabama Power executive — had come to his office early in the year. Cagle had filed a public records request with the PSC for the bills of the state issue cell phones for Dunn and Rountree. Dunn told me they were public record and, besides that, he and Rountree had nothing to hide. The records were provided. Cagle didn’t keep his request for Dunn and Rountree’s records a secret. 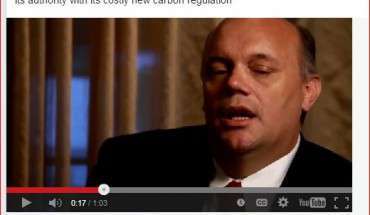 In January 2013, in an op-ed in the Birmingham News that took Dunn and Rountree to task for all manner of pretend sins, Cagle told readers that he intended to put the pair’s claims of not being in league with environmentalists to the test. If they’d found even one call to or from one of the “Environmental People” they’d have trumpeted this find as if proof that Terry Dunn is a pinko, lefty tree-hugging coal hater. Instead, nada. It’s my best guess that Cagle or someone he works with provided the page from Rountree’s cell phone bill showing his number. Even that assumes that Box even saw the phone record, or did anything beyond sign the complaint. The ultimate purpose here — in fact, the reason for the creation of Coal Jobs Count — is to try to publicly harm Dunn and by so doing, help Alabama Power’s annointed candidate, Chip Beeker, defeat Dunn in the Republican primary in June. If you read this far, thank you. Hopefully you can understand how what’s happening here — what’s been going on since late 2012 — has made me mad enough to work like a fiend on this story and so many others, to build not one but two web-sites, to even put together a pretty good video telling the story as I found it when I started back in September. The rest is a rant directed at the executives and government relations folks at Alabama Power, the Southern Company, and the army of people who work for or with all the mysteriously funded non-profits, associations, political consultants and lawyers who’ve played parts in the campaign against Dunn and Rountree. Right now, it’s 12:30 a.m., Friday morning, I’ve got a fever of 101 and I am not being paid to do this. I simply should not have to do much more. Do me a favor. Go to the nearest mirror. Give yourself a hard look. Ask yourself: If I do not put a stop to this, or help expose it, what right do I have to claim the moral high ground over the lowliest street pimp? I shouldn’t, really shouldn’t, resort to try to shaming and insulting you into doing the right thing. I’ve done it before, often, and it hasn’t worked. I’m learning the hard way. You can’t shame the shameless. 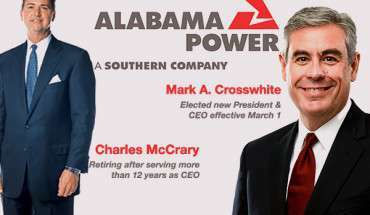 You can’t shame executives and directors and government relations and public relations people at the Alabama Power and the Southern Company. It’s not possible. So it looks like I’m just going to have to keep going. That so many fine upstanding, churchgoing folks like you would act in this manner. Well, it very much deserves exposing and I so much look forward to the day when the rain starts really coming down hard on you. With this latest act, you crossed a big line: An ethics complaint, as in, part and parcel as a criminal complaint, against a nice guy like David Rountree who has never done a single thing to harm you or Alabama Power. 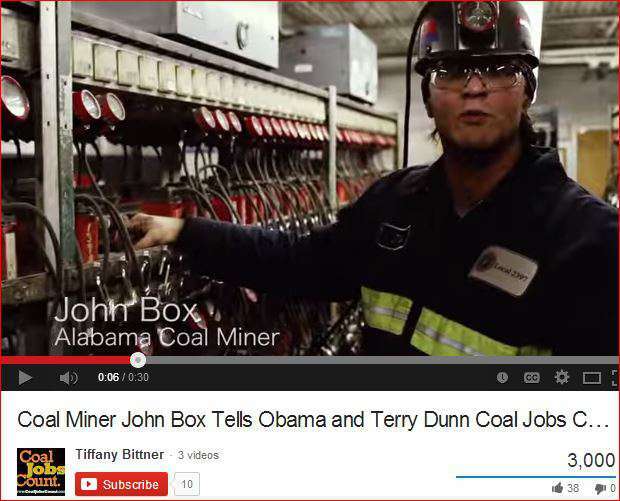 A month before his ethics complaint, John Box again served as Coal Jobs Count’s favorite miner at a Montgomery press conference, the purpose of which was to slam Terry Dunn. Earth to Coal Jobs Count: There are others miners. Please share the glory. At right, George Barber, Dunn basher and head of the Alabama Coal Association. Lastly, a picture of Rountree, brought to you by Patrick Cagle of the JobKeeper Alliance. Jobkeeper’s, and thus, Cagle’s. Their name is on it, but yours might as well be. And will be, before it’s all over. That’s my pledge to all of you.